Two male ports are 1/2"x24 pitch and one female port 1/2"x18 pitch. Fits John Deere models A, AO, AR, B, D, G, H Replaces AB2805R. 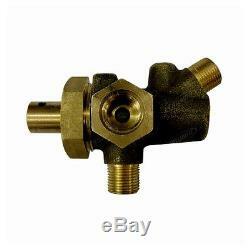 The item "3 Way Fuel Valve fits John Deere Models Listed Below AB2805R" is in sale since Wednesday, January 4, 2017. This item is in the category "Business & Industrial\Heavy Equipment, Parts & Attachments\Heavy Equipment Parts & Accessories\Antique & Vintage Equipment Parts".